Cutting the cable (or ditching the dish) can be a great way to save money. A lot of great content is accessible via the Internet, from sources like YouTube, Netflix, iTunes, and others. But there may be times when you’ll miss your local channels, whether for emergency news and notifications or just local programming. If you live in a rural area (or a crowded urban area) where rabbit-ears just don’t cut it, your house might already have a medium or large TV antenna installed in the attic or on the roof. But will your old antenna work with modern, digital TV? You might’ve heard of “HDTV” or “digital” TV antennas. In reality, though antennas can be designed for better reception (producing few or no digital artifacts), there’s really no such thing as a digital TV antenna. TV antennas don’t differentiate between analog and digital signals – they’re just collections of metal rods that pick up UHF and VHF transmissions at certain frequencies. The antenna doesn’t care what it’s picking up; it just passes signals along to the tuner (be it a tuner box or an integrated tuner inside your TV), which decodes them into a format that can be displayed on your TV. While newer antennas might be better-designed, older antennas may work just as well, provided they’re large enough and (if they’re directional) positioned correctly. In our case, the antenna was a large, 1970s multi-directional behemoth that was hanging in our attic, unused for decades. However, my dad remembered it working quite well for analog TV, before cable was available in our area, so we decided it was worth the risk to try wiring it back up. A balun is a device that converts between an unbalanced signal and a balanced one. For TV wiring, it converts old 300-ohm twin-lead wire to new 75-ohm coaxial wire. If you have existing twin-lead wiring (in good condition) run to your TV, you can just use a balun where the twin-lead ends and a short length of coax to connect it to the TV. Otherwise, coaxial generally holds up better. There are many arguments about twin-lead vs. coaxial – I’ll leave it to you to do your research on which would be better to use in your circumstances. In my case, the twin-lead had been cut halfway down the side of the house, and it wasn’t even running towards the family room (where our new TV is) anyway, so we went for coax. The first step in connecting the antenna to the TV is first getting to the antenna. If yours is roof-mounted, you’ll need to exercise some caution. Attic-mounted antennas (like ours) are considerably easier to get at, but our attic doesn’t have floorboards, so walking over to the antenna proved to be a delicate maneuver. 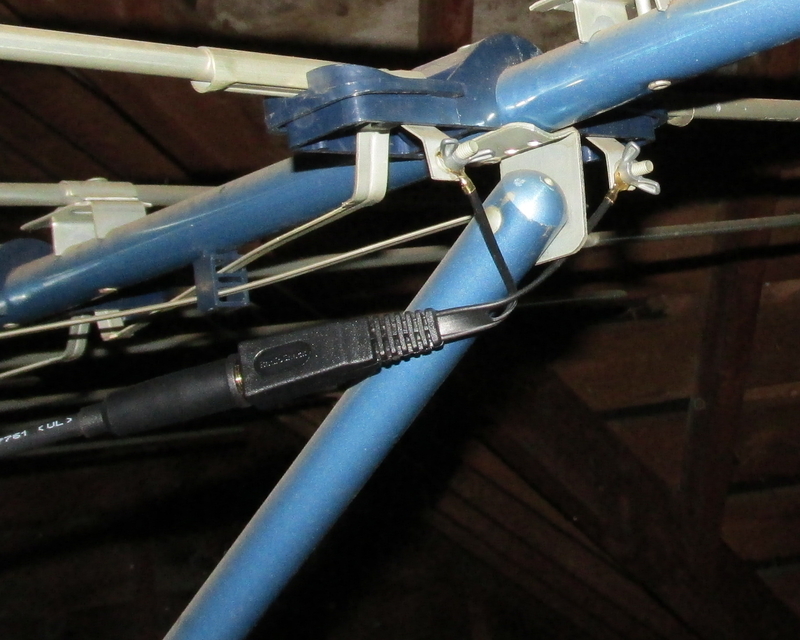 Our antenna uses two bolts with wing nuts to hold the twin leads. This is where we attached the balun. Under the right circumstances, a pre-amplifier (which boosts the signal) might be necessary. However, as pre-amps can also boost noise, it’s not recommended to use one unless you need to. In my case, our antenna was large enough that I didn’t think we’d need a pre-amp. 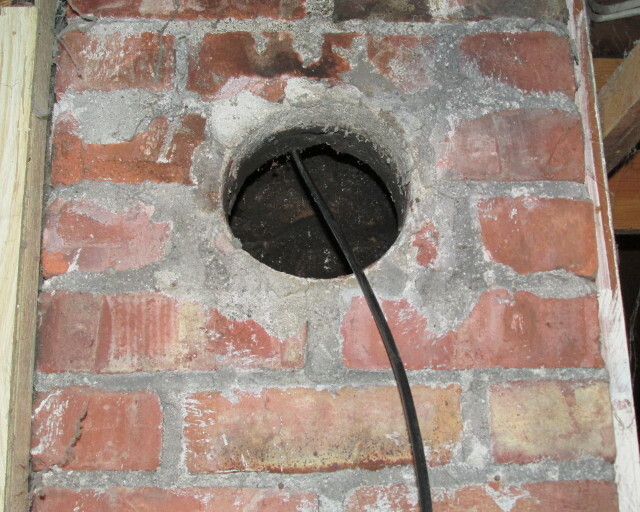 …and out through a vent in the chimney down in the basement. We had to tie a pair of pliers to the cable to weight it enough to make it go down the chimney, as it was cold and the cable kept coiling. What goes in must come out! This vent has a cap that goes over it – we carefully reinstalled the cap after running the coax. From there, we had to run it through the ceiling of the basement, around a cold air return vent, and out into the crawlspace. 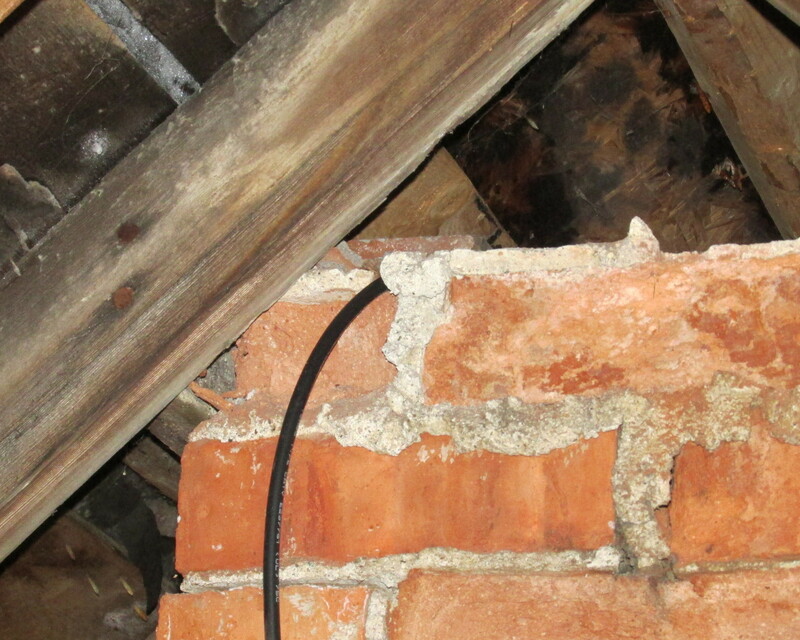 At the very end of the crawlspace, we drilled a hole behind the TV for the cable to run up through. We connected the other end of the coaxial cable to the TV, scanned for channels, and instead of the usual six we’d had with smaller antennas (three stations with high transmit power, plus subchannels), we found 21 channels, including several HD channels (KCCI supposedly came through in 1080p, though our TV is only 720p). Clear, vivid HDTV, thanks to our old antenna and a very long cable. 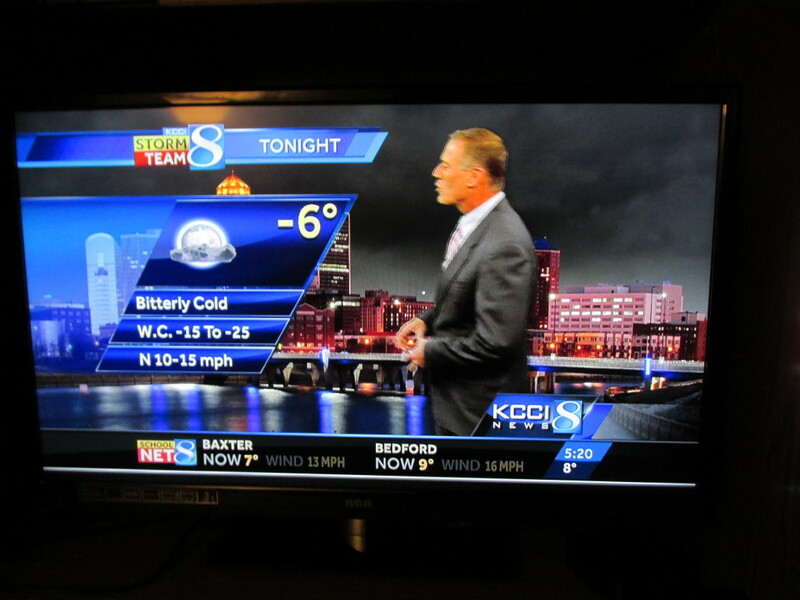 KCCI’s transmitter is located (along with several other towers) about an hour (50 miles) south of where we live. We actually picked up two zones of Iowa Public Television – KDIN in Des Moines and KTIN in Fort Dodge! Nice work. I have an antenna hooked up because the CW is only in HD over the air where I live. Picture quality on all my OTA channels is better than cable since time warner compresses everything. My antenna is just a cheap set of rabbit ears though, nothing like your beast, but they work well enough. I’ve cut the cord 3 years ago this month and will never go back to cable. My set up includes a couple of MacBook Pros connected to the internet for streaming video and audio + a small Audio Vox TV-DVD player that is hooked up to a small indoor antenna. Gotta get my local news and programs. Since I live in an urban area, I get most of the TV stations I want with the antenna I currently use… 16 in all. I plan to get a MOHU antenna so that I can pick up all of the stations in my area. Good article on the big old antenna. I may look into this for my Mom’s home in a rural area. I cut out cable not long ago and am still getting everything the way I’d like it. I’ve found that since the digital transition, most stations are now UHF. Even if the station number is below 13 it’s often a virtual channel. Most stations have one or two sub-channels as well and I was surprised how many channels I have. My setup too. A signal preamp (e.g. Antennacraft) can double signal strength. I record shows on a G4. What sort of G4? iMac or Power Mac? Just curious, what hardware do you use to record, something like a USB DTV tuner? I have rabbit ears for my 40″ Sony and Apple tv set up. My “ears” are the “digital” kind so they just plug into the back. I have four PBS channels and six other local channels….I think the only thing I’ve ever watched is PBS and the occasional NFL game. I don’t like television programming for the most part anymore, just a bunch of crap. I will admit to watching The Blacklist with James Spader. I’ve had a man-crush on him since Less Than Zero.